Please Note: I have two blog posts today; this one and the Calendar Girls Challenge that follows it. Thank you for taking a look at both of them. There are two sponsors for this challenge! And each of them are offering a wonderful prize package to a lucky challenge participant!!! 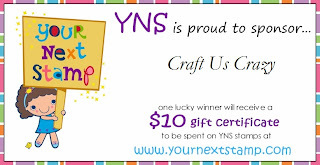 You can learn something about each of these amazing sponsors on the Craft Us Crazy Challenge Blog. Please check it out! Oh, and the guidelines for joining the challenge are there, too. 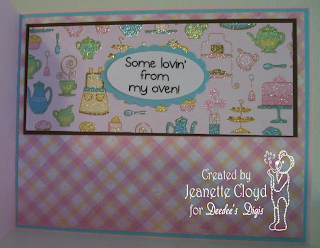 Meljen's Designs also offered a digital image to the Craft Us Crazy design team so we could use it for our cards for the challenge. 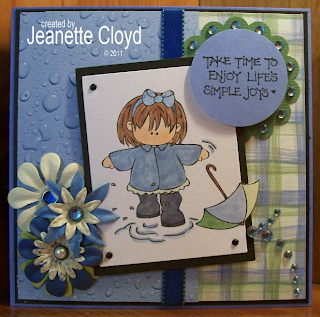 THANK YOU, Meljen's Designs! 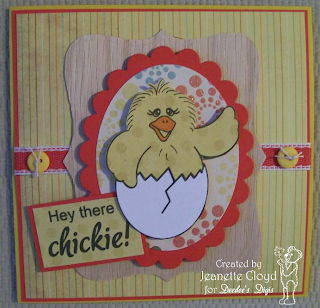 I love Meljen's Designs images! 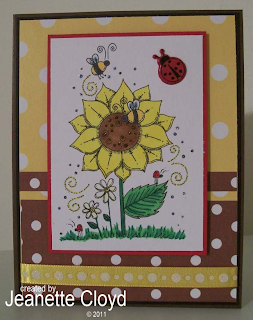 I chose to use the cute Cute CUTE Sunflower Buggies image. 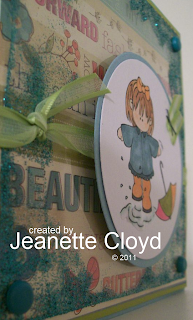 I hope you'll participate in the Craft Us Crazy Challenge! They are a lot of fun!!! Spring Rains have begun here in northern Illinois. I am so glad... not because we need the rain (we don't), but because it means Spring has arrived! YAY! Do you know what else has arrived? 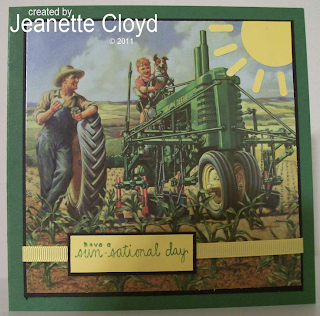 April 28th... which means it's the day for the Calendar Girls to post their creations based on Miss April's specifications. How fun!!! 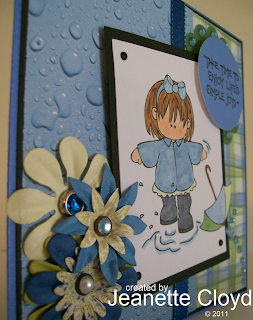 We have all heard the saying “April showers bring May flowers”…..I know we are all tired of winter and looking forward to Spring rains that bring out the Summer flowers! 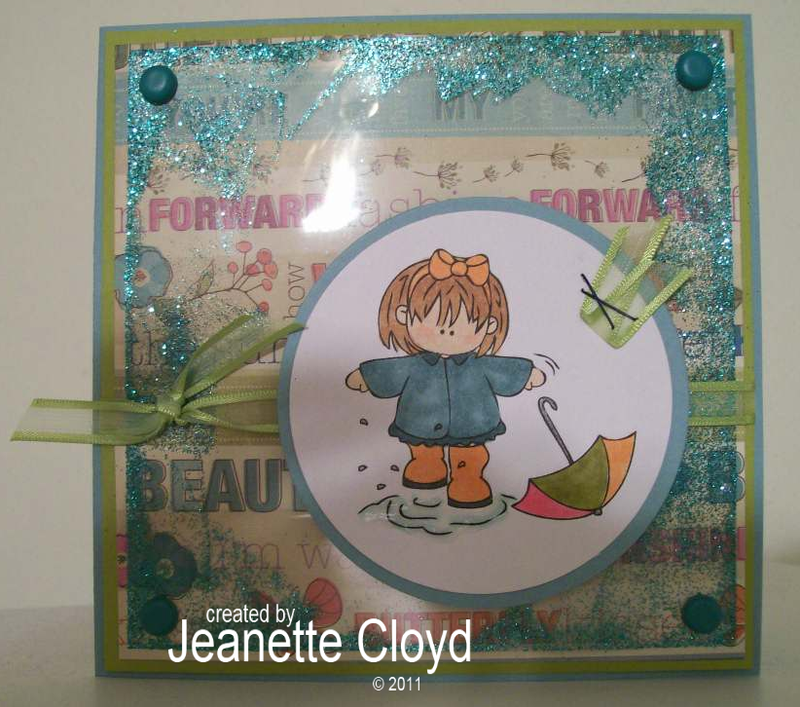 My challenge to you is to show me your April showers! 1. 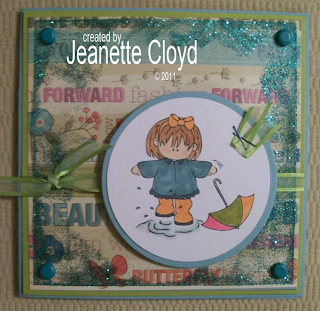 Use an image with a duck, a puddle, an umbrella or anything resembling rain or water! 2. 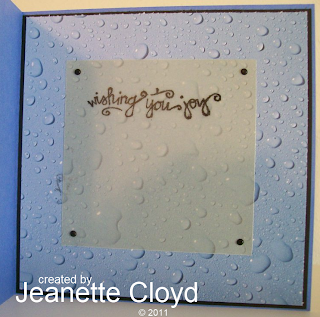 Use a fun technique on your card that is “water” related! There are so many things out there that can look like water…..use your imagination and have fun! I decided to try a brand-new-to-me technique with my card. In fact, until Terry posted the challenge, I didn't even know it was possible to do this. 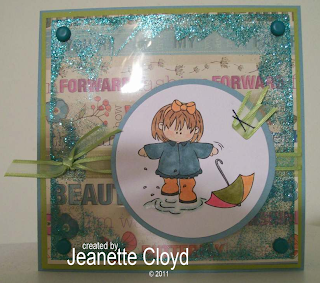 I used the Stamp Fairy Patsy April Showers digital image. If nothing else, the name seemed appropriate. LOL! Seriously though... I love this image. You probably remember that I used her a couple of weeks ago for a design team challenge. Well, here she is again, just as cute as can be! For the glossy rain puddle, I used some Sakura Crystal Lacquer. Isn't the embossing around the edge of the acetate awesome? I love how it sparkles (it was glittery embossing powder). I'll definitely be using that technique again sometime. Okay... let's go see what the other Calendar Girls came up with. You can find the links to their blogs in my left-hand side bar. It's a Week of Weddings! Yes, love is in the air with this week's Wedding of the Prince William and Kate Middleton.... so we're going to celebrate with a Wedding Challenge. How fun! 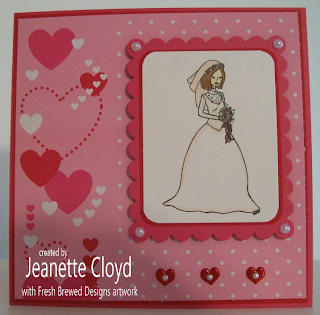 The Stampendous sentiment seems to go well with the Fresh Brewed Designs Beautiful Bride image. 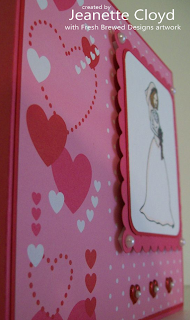 Every wedding needs pearls, so I added some as an embellishment for my card. I have great online friends! Really, I do! 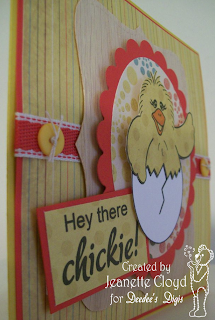 They are such fun to chat with... and we have the fun of creating together, too! I'm part of a group that swaps MYSTERIOUSLY every other month. It works like this - someone in the group is the hostess. She sends images (and if she wants to she also sends a little extra something) to the group. 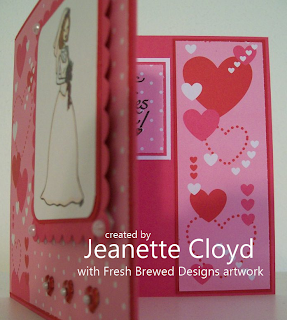 We then each create four cards with her images (and extras) plus whatever supplies of our own that we choose to use. We then mail them to her and she swaps them out. We in return get three awesome cards with the same images. Isn't that a fun idea? Tami was our hostess for the most recent round. Wow! She sent us the CUTEST little girl image. She tells us the image is from The Angel Company, but I'm not sure what set she is from. I know I would love to own it, though! 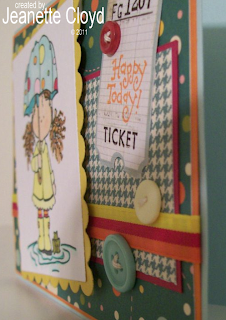 Tami also sent us a little ticket and a small piece of designer paper. It was such a fun assortment. 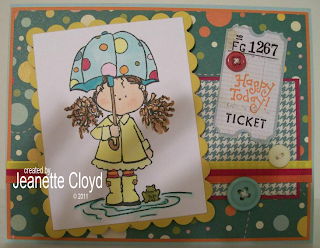 I added cardtock, a piece of designer paper, buttons, ribbon, and a sentiment on the tag. Oh, and I colored the image, too. Thank you, Tami! And thanks to all my Mysterious Friends, too! I'm rushing on my way to Kansas City for the long holiday weekend... no time for chit chat. However, I do want to tell you that there is a new Chi Chi Memories Challenge beginning today. It goes for two weeks, so there's plenty of time for you to participate. 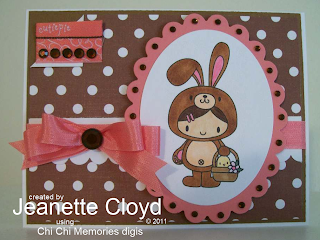 Go to the Chi Chi Memories Challenge blog for all the details, including the sketch. 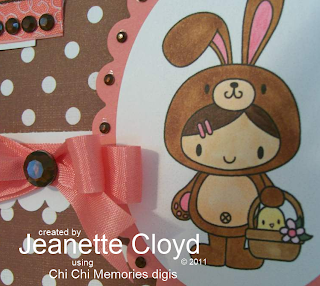 The image I used is part of the Chi Chi Memories Happy Easter set. 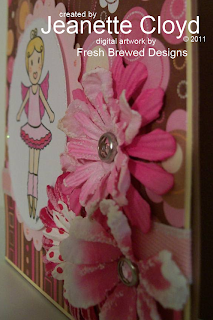 All of my supplies (papers, ribbon, etc) are from my scrap bin, except for the rhinestones. They are from the dollar aisle at Michael's. 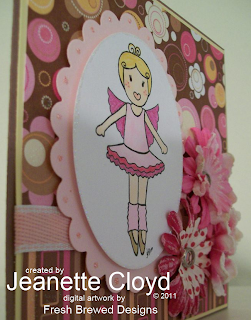 All things sparkly include: Stickles glitter glue (spots on pink oval and outline on image oval), Copic Spica pen for part of the coloring of the ballerina image, rhinestone brads for flower centers, sparkly flowers, and glittery designer papers. 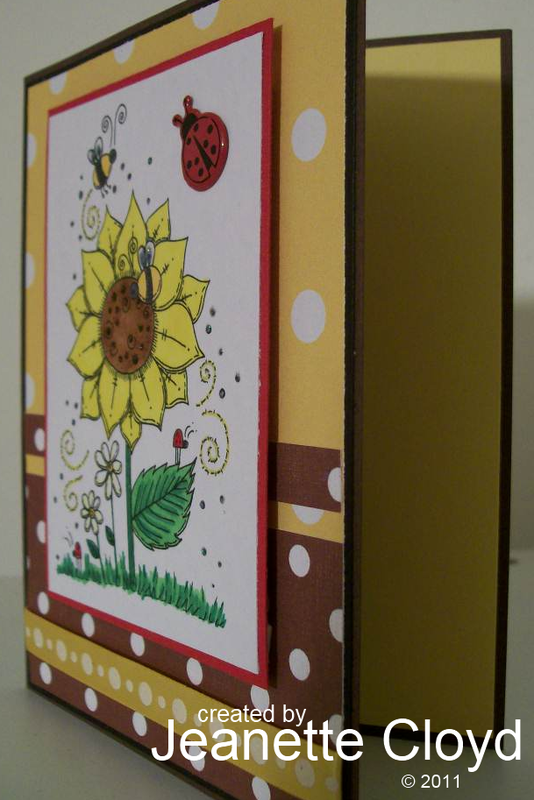 There's lots of depth/layering to this card. 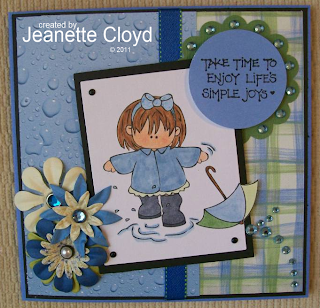 Enjoy Life's Simple Joys - Walk in the Rain! 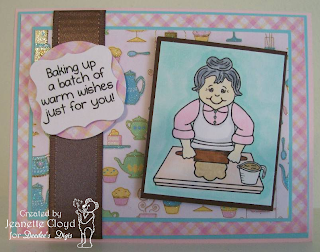 One of the things I love about being on the Craft Us Crazy Challenge Design Team is that I have the opportunity to use some pretty awesome digi stamps provided by the challenge sponsors. 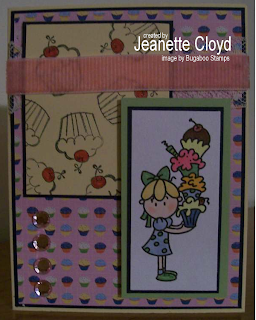 This month Stamp Fairy is the monthly sponsor, and the owner let the design team choose a digital image to use. YAY!!! Shopping is such fun! THANK YOU, Stamp Fairy!!! Isn't she darling? 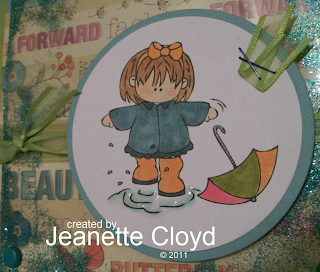 I love the way she is stomping in the rain puddle! 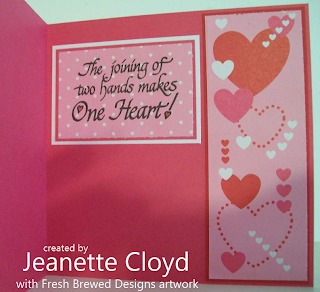 I used two different sentiment rubber stamps that I have - one inside and one on the front of the card. 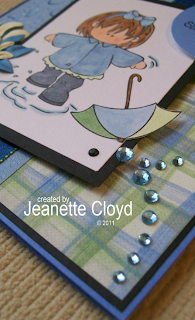 I also added lots of sparkle and layers of papers. 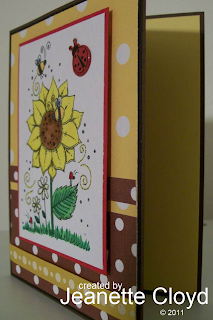 I love the look of the splashy paper. Can you tell I like rhinestones? The rhinestones in the lower right corner are supposed to look like droplets of rain water, splashing as Patsy stomps in the puddle. 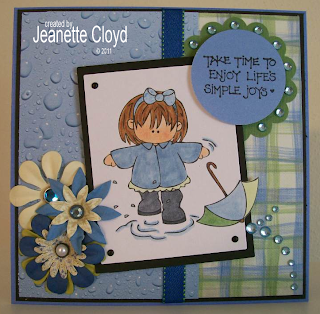 Be sure to check out Stamp Fairy... there are lots and lots of fun images! 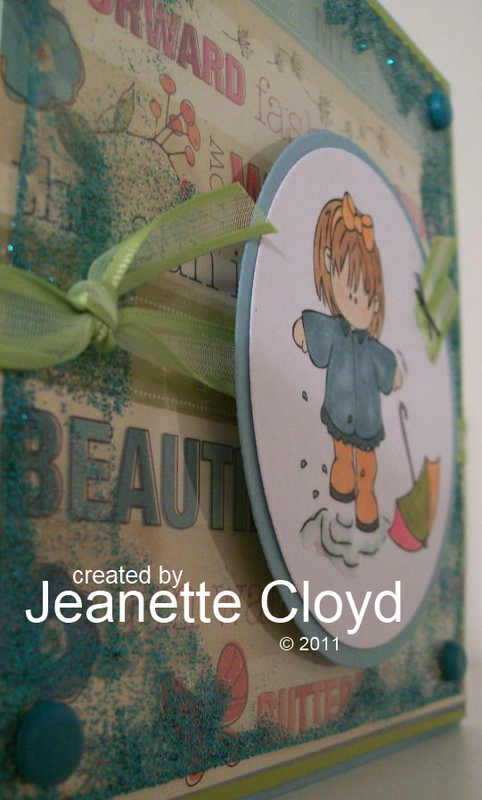 And don't forget to play along in the Craft Us Crazy Challenge! 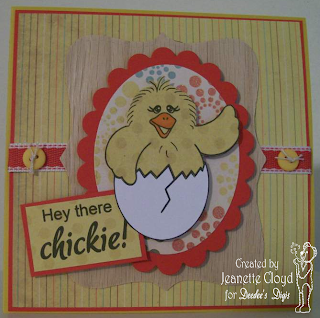 This week's challenge is sponsored by K 'n K Designs. 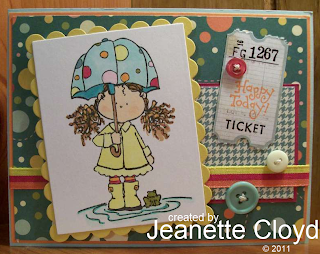 Katlyn, the owner of K 'n K Designs has generously given each of the Happy Monday Challenge design team members an image to use in creating a card for this week's challenge. THANK YOU Katlyn!!! Yes, I know it isn't Halloween, but when Katlyn let us choose the image we wanted, this is the one that called out to me. Oh, and in case you couldn't tell, I love googly eyes!!! 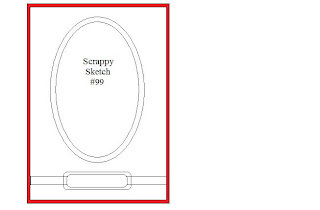 The recipe for this week's challenge is to use both a digital image and a stamp on your project. 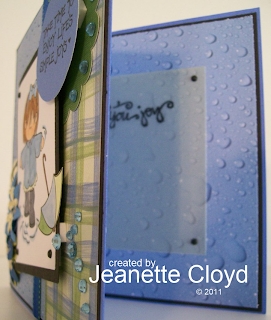 My card features both a Bugagoo digital image and a Studio G stamped image. Now it's your turn... I'd love for you to participate in this week's challenge! 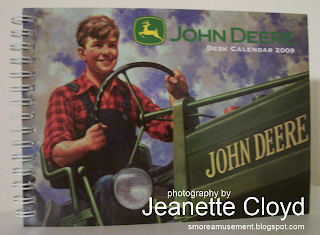 For those of you who may not be aware of such things, I live near the John Deere Headquarters. It is not an understatement to say there is a lot of interest in green tractors and other green implements in my community. This is a very simple card. 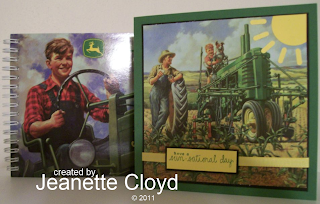 I used one of the fun pictures from the calendar for the main part of the card. I punched out a circle and some little strips to create a sun. I added a sentiment (it's an A Muse stamp!!!) 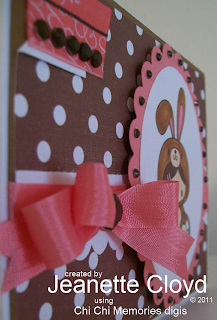 and a piece of ribbon for a simple embellishment. 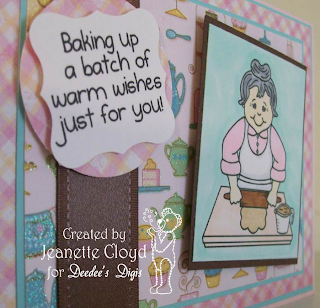 Welcome to Heather's Sweet Birthday Blog Hop! Note: I have two blog posts today; this one and the Dueling Darling one. Please keep scrolling to see both of them! 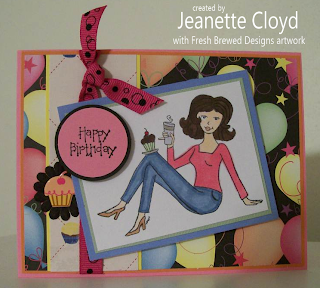 We are so excited to celebrate Heather's birthday today, owner and designer for Fresh Brewed Designs! And we are even more excited to share this special day with you all, too! 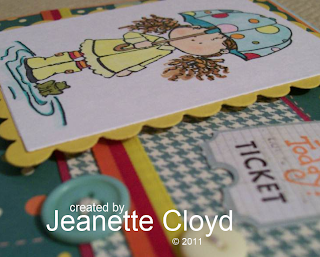 Today is a celebration blog hop to honor one of the most sweetest and faith-filled gals we have been blessed to meet! 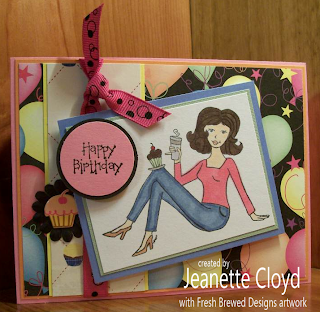 It's Heather's birthday and that means YOU are in for a treat with the cards and creations on this hop! AND a little "Goodie Bag" treat for one lucky random.org winner! 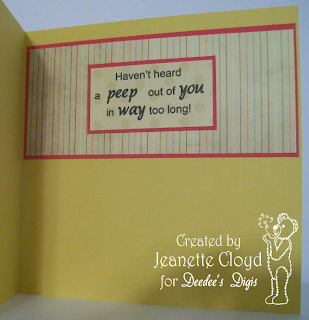 If you arrived on this sweet birthday hop from Stacy's blog, then you are in the right place! If not, please start at the beginning and hop along to all the stops so you won't miss any of the yummiest along the way! 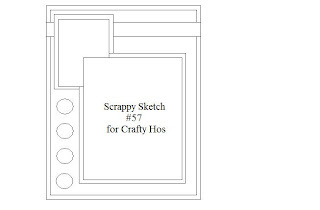 Now it's time for you to head on over to Carolyn's blog (your next stop on the hop). Be sure to leave a comment at the hoppers along the way to be eligible for the "Goodie Bag" Birthday candy! 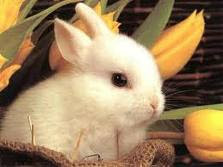 Thanks bunches for hopping along with us and sharing this most blessed birthday today! 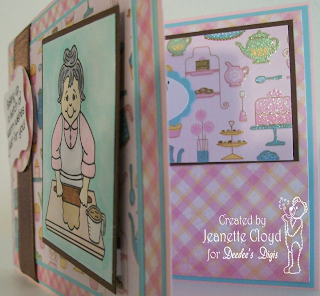 And stop by Heather's blog to wish her a very Happy, Sweet Birthday! 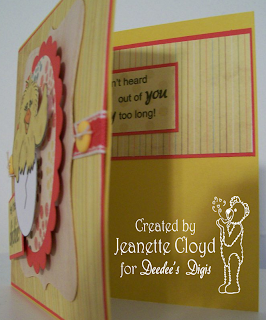 Is It Spring Outside Your Window?